A lot of people do not like Fire Emblem: Awakening. Some of the most vocally criticized features are the overworld skirmishes and the changed support system (which earned it the name Waifu Emblem, for the many characters who could get married). While the game was successful, a lot of long-time fans of the tactics series view Awakening as one of the worst members. But it turns out these much-maligned elements of the game are absolutely critical for the overall narrative of the game. One motif unifies Awakening very clearly: destiny, and the rejection of it. The player’s avatar, Robin, is specifically created in the game’s world to host the Fell Dragon Grima, and yet rejects that future. However, it is somewhat unclear why Robin does reject this. The game suggests from dialogue that it is the relationships cultivated between Robin and the rest of the army that cause the change. However, I wish to argue here that the “invisible ties” that allow Robin to reject Grima are the player’s interaction with the game. This reading is supported both by the evidence in the plot and in the mechanics. As a result, it will prove a particularly effective way to justify many confusing elements of the game, revealing Awakening as an excellent case-study of the way mechanics and narrative can cooperate to enhance a player’s experience. 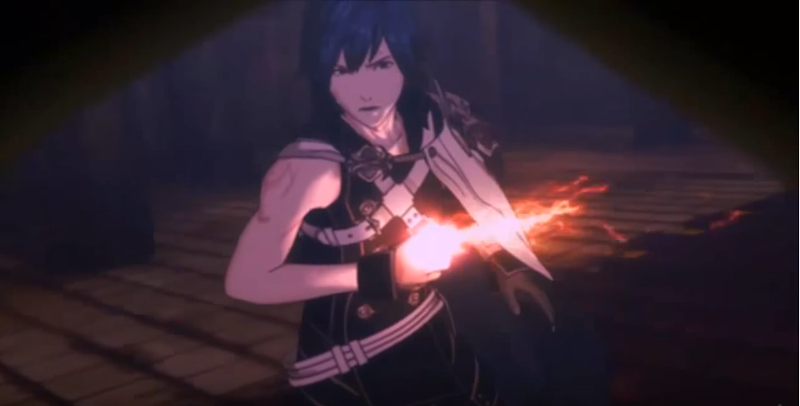 Throughout Awakening, only one scene happens twice: Chrom and Robin fighting against the evil sorcerer Validar. It is seen at the very start of the game, after avatar creation, and again at the climax of the game, in Chapter 23. Both chapters are titled “Invisible Ties.” The mere repetition of the event immediately demands attention; the first occurrence appears to be a vision of the future. Examining this moment, which is both the beginning and the climax of the plot, reveals the central narrative element that justifies the other systems surrounding the main tactical gameplay. Initially, the two scenes appear to be identical: the same cutscene plays! But, once the actual map starts, subtle differences reveal the truth. Chrom and Robin’s equipment and stats will be different in Chapter 23 than in the Premonition. While this could be explained as merely a necessity of a tutorial, so much is repeated without comment that the differences that do exist are almost highlighted by the game, meriting further attention. The game finally tips its hand at the end of Chapter 23. There are actually two Robins: the player’s avatar and one from an alternate universe. Alternate-Robin chose to kill Chrom and host Grima in their own timeline, and will host Grima again in this one. But, Alternate-Robin traveled to the past (and, in so doing, crossed dimensions), which gave the avatar-Robin the ‘premonition’. This, however, fails to actually resolve what makes this scene interesting: every other detail within the scene is the same. Chrom and Robin are fast friends in both instances; both kill Validar, the sorcerer who is trying to resurrect Grima, and both have traveled the world together. These similarities imply fairly heavily that every major plot beat of the game is identical between the two worlds. But, for some reason, the two Robins make different choices. The lack of a reason is, fairly obviously, a plot hole, and has been called out as such. I’m sure Chrom will be fine. However, confirming that view would be a little too hasty. I think there is a reason available to us that explains why the two Robins made different choices. There is one, and only one, other difference visible in the in-game evidence: the presence of the player. 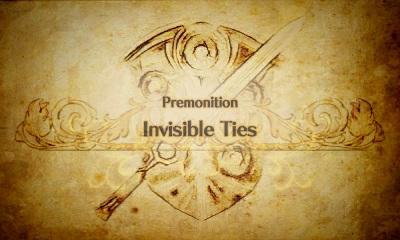 Remember, the ‘premonition’ is actually a memory; despite playing it, there is no room for the player’s influence. This makes some intuitive sense: the Premonition map is the tutorial for the basic mechanics of the game. It should not be possible to lose that fight, to change that part of the story. But, the second time Chrom and Robin fight Validar, there is much more room for player agency, and in fact the cutscene is a part of a much longer chapter, with many more units and turns for player control. This explanation makes some sense. The player, naturally, doesn’t want to kill their own units in order to become a world-destroying dragon! Anyway, moving on. It makes intuitive sense that the player would be able to impose their will onto the avatar, driving Robin away from their initial fate. However, this means that ‘player’ and ‘avatar’ are not interchangeable words here.  Instead, the player is an external agent who exerts influence on the avatar, causing them to behave in certain ways. Robin has a personality independent of the player. This is most clearly visible in the supports; the writers for the game scripted 3-4 conversations between Robin and every other character. We’ll return to them later, but that large volume means that Robin inevitably acts in a way during those supports that the player would not have done if they were in control (as an easy case study, Robin is vocally not a very confident cook; I, personally, am completely different. I’m probably not a better cook, but I’m certainly a more confident one). Robin is not required on every map! Even during the main plot, there are many chapters (such as Chapter 13, the ending for the first story arc of the game) where Robin is treated by the game identically to any other member of the army. And yet the player still plays any map Robin is not present on, proving the player has influence on the game in ways that are not reliant on Robin. In order for this explanation of the climax to be effective, two things have to be true. First, the characters within the narrative have to be ultimately unable to divert the course of fate. Secondly, the player has to always want Robin to refuse Grima. To show that these are in fact true, I will use the first act of the game to show the characters’ inability to divert fate. Then I’ll show how the game tries very, very hard in order to establish the desired attachment to the army through the mechanics that are so often criticized. 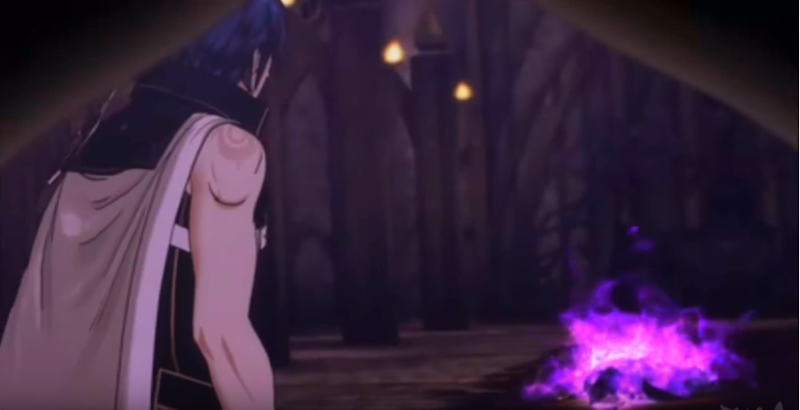 The first act of Awakening really powerfully highlights the limited ability characters within the narrative (including Robin) have on the game. By exploring this failure, I hope to demonstrate that the ties between the characters alone are insufficient to change the path of fate (and therefore necessitate a player-centered explanation). This is important groundwork to show why matchmaking and skirmishes are vital to the game’s narrative. Shortly after the Premonition (from the player’s perspective), monsters called Risen start appearing around the world, and a mysterious young man named Marth saves Lissa’s life. “Marth” is actually named Lucina, and she is alternate-Chrom’s daughter, sent from her timeline into the player’s to stop Grima’s rise. Lucina escaping from her universe before the start of the game. Lucina thinks that the best way to do this is to stop the assassination of Emmeryn, Chrom’s older sister and the ruler of one of the game’s countries, Ylisse. To that end, she follows the player’s army around for the first act of the game, meeting them at critical junctures. The first real attempt the characters make to change destiny comes when Lucina infiltrates the palace and saves Emmeryn from an assassination attempt. In Lucina’s timeline, Emmeryn died in that assassination attempt. 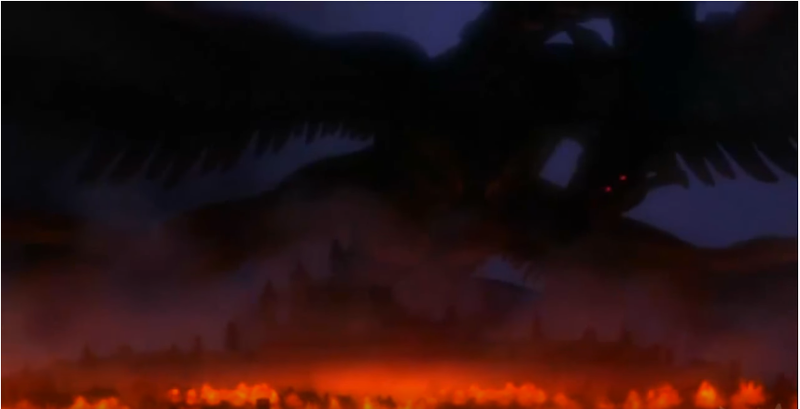 Lucina thinks that, by saving Emmeryn there, the path to Grima’s resurrection has been avoided. And for a moment it works; Emmeryn reacts and goes into hiding. But while on the road, she gets ambushed, captured, and scheduled for execution. The assassins were sent as part of a war effort against Ylisse by the neighboring country, Plegia, and its king, Gangrel. Robin is the tactician in Chrom’s army, and their brilliance wins every battle against Gangrel. Despite this, Gangrel tricks Chrom and Robin, forcing them to surrender to save Emmeryn. To spare Chrom the choice, Emmeryn chooses to walk off a cliff to her death. What makes this story arc a useful case study is its position within the game. This is during the early game, before the full extent of the mechanics is available to the player. There still is a world map, but there are only 4 optional maps before Emmeryn’s death, and the benefits of an S-rank support (i.e. a marriage) are not yet visible. In addition, Lucina is explicitly and directly working as an NPC to change fate. So, it’s a perfect foil for the climax of the game later. The characters, under their own power, only change details within the story, not the overall path of the narrative. 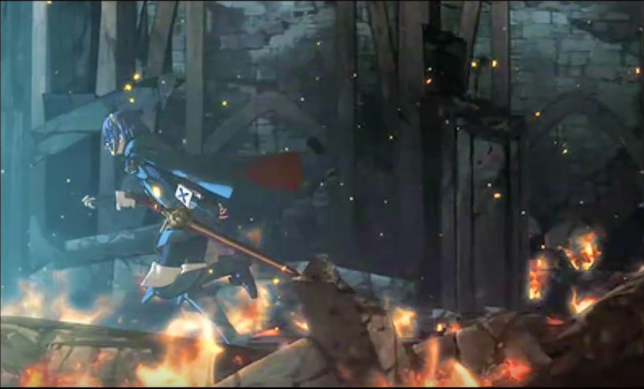 Lucina comments on it in the moment, and a few other characters reference that moment later in the game. To put it in as Gangrel would: “[Emmeryn] wound up in the ground anyway!” Despite everything Chrom, Robin, and Lucina did to stop that outcome, all they managed to do was to change the manner of the path to Grima’s resurrection, not the end state. This is significant. The ties between the characters, and Chrom’s love of his older sister, aren’t enough to save her life. So, we can conclude that the “invisible ties,” which have already been established as important to this discussion, are not the connections between the characters. Otherwise, surely the connection between close siblings would be enough to change destiny! Now that we’ve established that the characters are not capable of actually causing the kind of large-scale shift in the plot that we observe between the Premonition and Chapter 23, we can turn to the other advantage of my explanation: some of the most criticized mechanics of Awakening are very effective at getting the player attached to their army, which helps motivate them to change fate within the game. 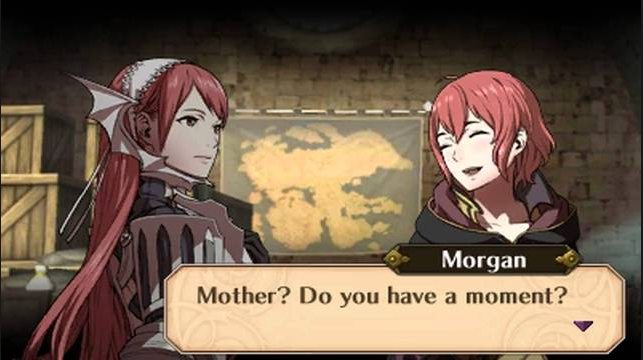 In Awakening, whenever two characters reach the highest level of support, S-rank, they get married and a paralogue opens up where you can go recruit their future-kid into your army. It’s a strange system, but a not-insubstantial one. To explain supports: whenever two compatible units perform certain actions while standing next to each other, they’ll gain a few points on an invisible meter. Once they cross certain thresholds, a new conversation unlocks, which also confers stat boosts to both characters while they are paired up. C-rank is basically starting a friendship, while A-rank is best friends. If the two people supporting are of opposite gender, they can get married. A support between Cherche and her child with Robin, Morgan. Unlike characters from earlier games in the Fire Emblem series, a character in Awakening can have infinite supports. This encourages mixing and matching the active units instead of developing a primary team like in other games. In return, not only does this give the player more options on individual maps, but it also makes the player invested in nearly every unit. Most characters can only support with a few others, but Robin can support with Every Single Character in the game. The rationale for this is obvious: Robin is the player’s avatar, and the designers want to ensure that Robin gets along with whomever the players like. There are over 50 characters in the game, though, and only 25 main chapters! And in those chapters, enemies get stronger very quickly. Even at Chapter 9, in which Emmeryn dies, the enemies outclass low-level units. As a result, simply rushing through the plot ensures that most of the supports are ignored. As more events occur, it would quickly become impossible to trigger the conversations between characters who have not always been in a player’s top team. This is bad; even by the game’s own admission, it would make little sense for there to be “invisible ties” if most of the characters never interacted with each other. 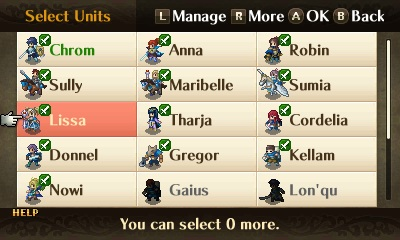 A sample team size from Chapter 11 of Awakening. The world map solves that challenge. In between chapters, the army can travel around the world fighting in skirmishes. This can break the difficulty curve of the game entirely, but it can also allow the player to raise characters up to the level of the game, instead of just abandoning them. Obviously, these fights can’t literally be happening in the fiction of the game: there are sometimes a few hours of game-world time between chapters, and yet the player can run all around the world for 17 battles before returning to that. But, narrative moments, in the form of supports, still come from these non-canon battles. I’d like to propose that we treat the skirmish system as an abstraction of off-stage battles throughout the plot. The game makes it clear that often massive armies are fighting (the largest number thrown out is slightly over 1 million troops). But, we only control 10-15 units per chapter. So, the skirmishes simulate all the work that the other units are doing, and the relationships they are cultivating in real time, without requiring gigantic levels. By abstracting character relationships, the game invests the player in almost every character on a deeply personal level. As a result, it is almost inevitable that the player does not want these characters to just get killed in a massive anti-climax. In other words, despite the coolness of turning into a dragon, the player is opposed to that result, and therefore has both the ability and the desire to cause the divergence of fate I described earlier in this article. Though, I have to admit, it is a pretty cool dragon. While there are still many parts of Awakening that can be criticized, I believe that some of the many systems that lay adjacent to the plot are actually necessary for the climax of the game to function effectively. The notion of the player as a separate entity from Robin is set up from the very beginning of the game, and made necessary by the failure of the characters within the action to turn the world away from Grima’s rise. The secondary mechanics, such as supports and skirmishes, then become an abstraction for the player’s benefit, surrounding the player in a web of friendships that they can’t help but become engaged in. It all pays off in the end, when that engagement influences Robin to reject Grima, unlike the alternate universe Robin, who becomes the final boss of the game. 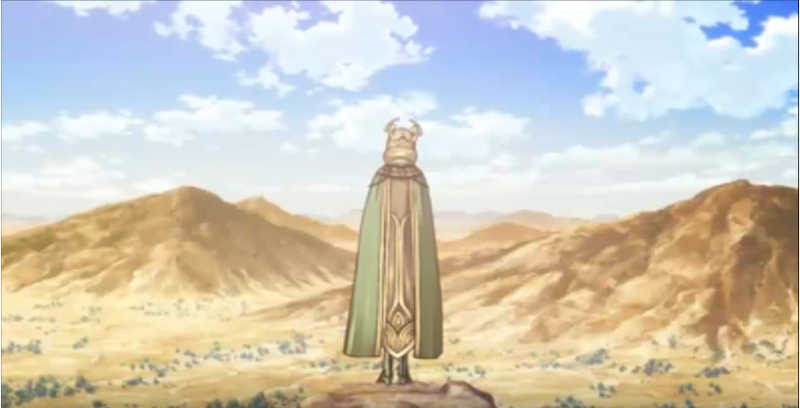 Therefore, far from being the disjointed mess many fans of Fire Emblem claim it is, Awakening turns its systems into a potent example of how mechanics can effectively support a game’s narrative, even when they are tangential to the plot. So am I the only one that exploited the risen box system to get Chrom and robin to level twenty before her death as well as get all the characters to s rank.